After a long wait, we've got some truly impressive content to show you this week, including magnificent models, materials, menus and music. Seriously! 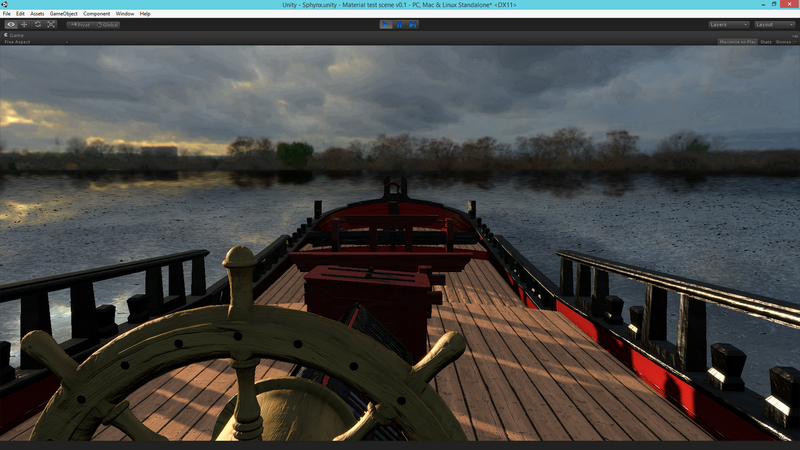 As you may be aware, voting for the IndieDB Indie of the Year Award 2014 is currently underway. Due to the pre-alpha state of Hearts of Oak, and the lack of a public release so far, we felt it wasn't appropriate to ask everyone to vote for it, so we didn't. And yet, thanks to people like you, Hearts of Oak has made it into the Top 100 anyway! We are immensely humbled by your support for this game even in such an early stage of development, and we couldn't be happier with this achievement! Now, we have the opportunity to see just how far the game can climb up the Top 100 in the second round of voting. If you voted for us in the first round and you believe our game deserves even more recognition, then please do vote again in the second round! 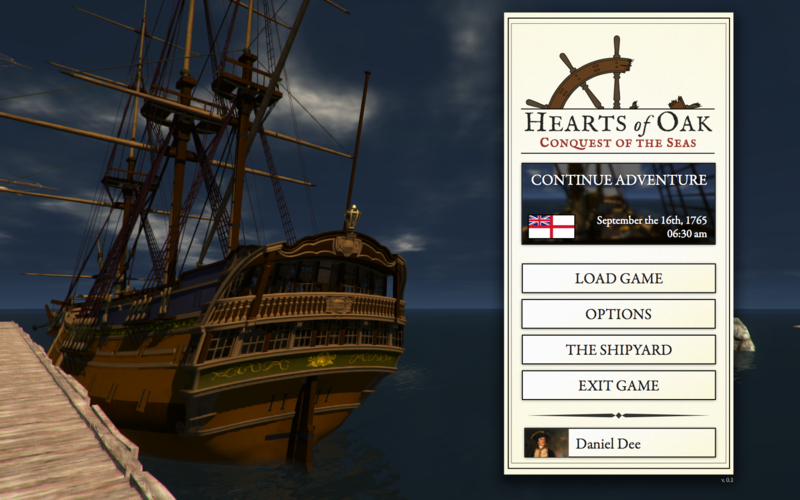 You can find Hearts of Oak under Upcoming Games > Role Playing on the Top 100 page. Please note that voting closes on 21st December. Anything we can manage from here on is a bonus, but we continue to be blown away by your support and we're hugely grateful for it. New member Danidr has taken on the task of designing a new main menu for the game, which suits the game's overall aesthetic. 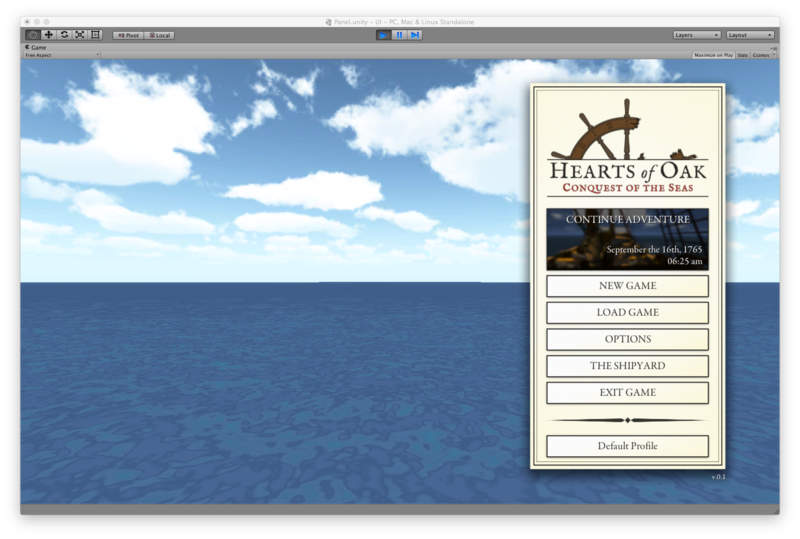 The background is a screenshot from the internal test build, and the menu box has several features worth noting. The "Continue Adventure" button will allow the player to immediately pick up where they left off when they start the game; the example shown is a placeholder. 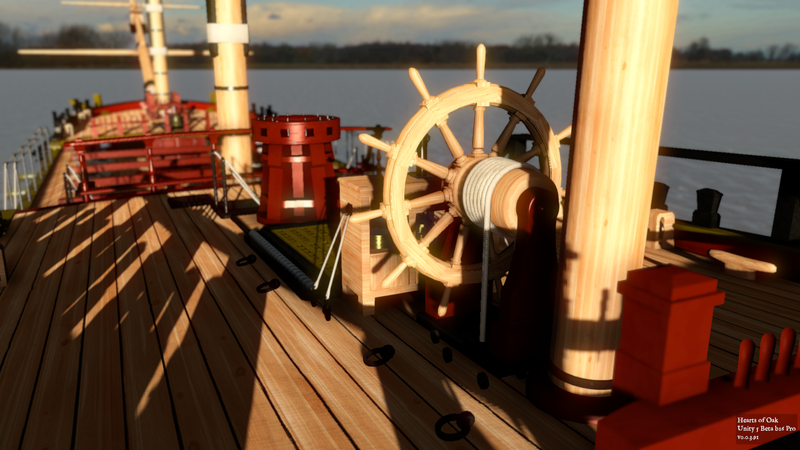 Below that we've got the pretty standard Load Game, Options and Exit Game, but there's also The Shipyard and a player profile example at the bottom. 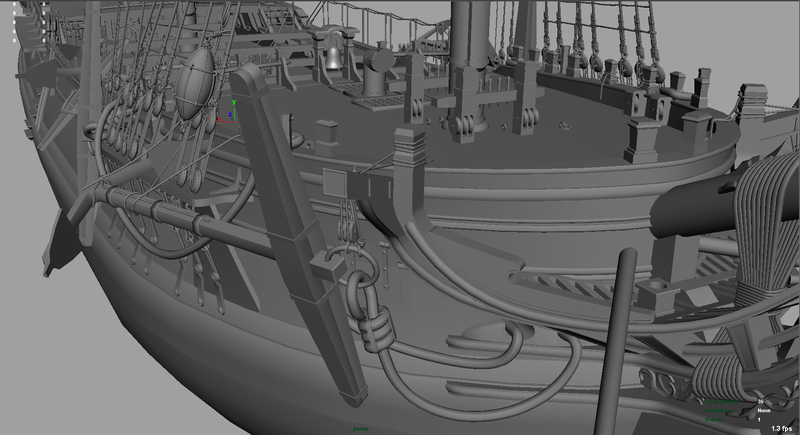 We'll be explaining more about The Shipyard in the coming weeks. 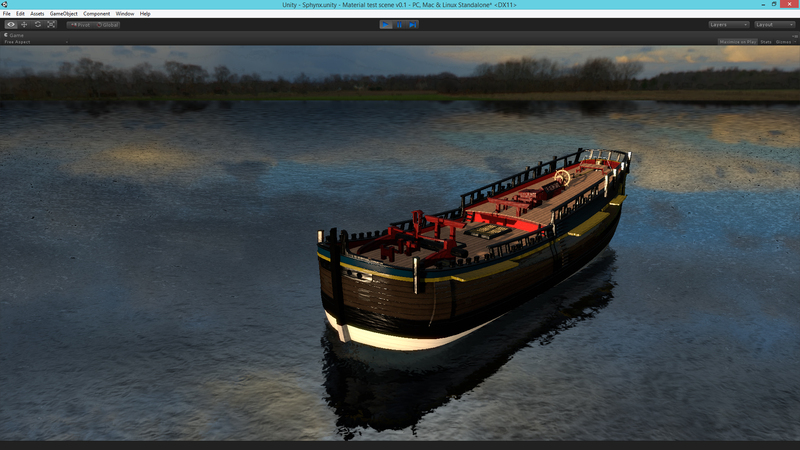 We have been experimenting with Substances for several weeks now, as an alternative to more traditional textures. 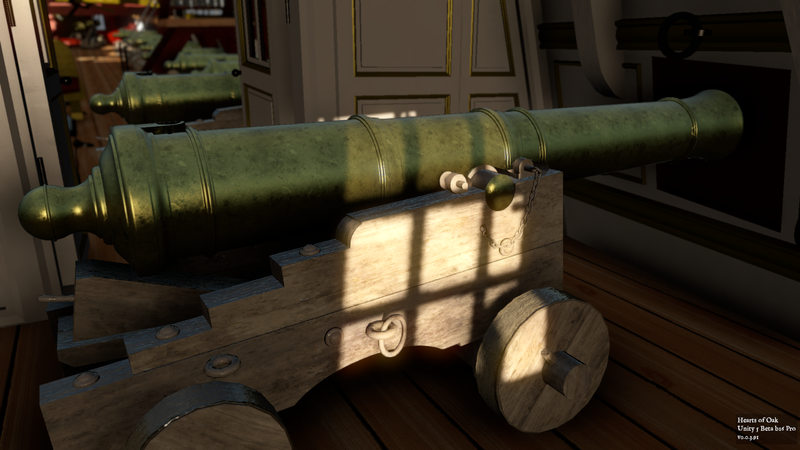 In the videos below, Captain Murphy explains the process behind making a Substance, the key features they provide and why they're ideal for some of our needs. To help artists to easily see how their models will look in Unity, Ashinokami has developed a test scene specifically to showcase materials in the engine. 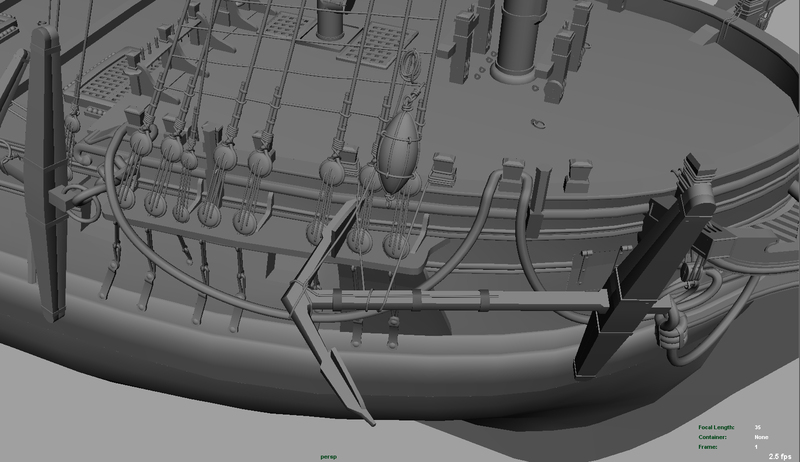 This ship now has all the most basic details required to test her as a floating battery in-game, including all gunports, ladders between decks, and the rudder. 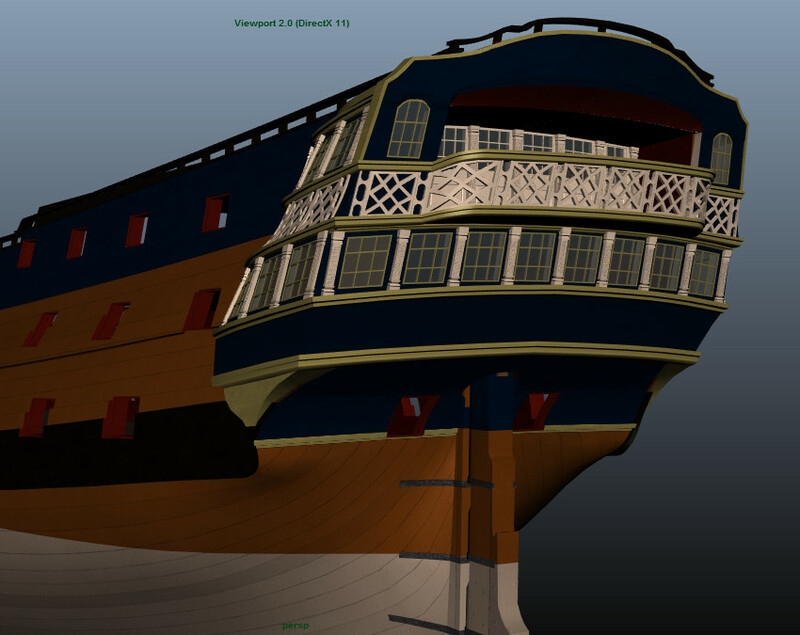 The model also has the railings installed along the upper sides of the hull. Although she looks a bit empty at the moment and more components will be added eventually, we hope to give her a full set of guns in Unity soon. Ropes. Do you like ropes? I hope so, because this ship has more than you can count. This tiny island has been mapped from height data in 1:4 scale using World Machine, and trees have been added to populate the land. This week, we've got a brand new track called "Man O War", composed by Dastroids. Dastroids wrote: When I wrote the piece I imagined myself on a big man o war firing cannons, and of course I was the captain giving the orders. Excellent work, a feast to the eyes and the ears.